If you spent an hour of your life listening to the first part of my recent conversation with Guy about the Karate Kid, here's Part 2. Not Karate Kid Part 2...part two of the conversation. We talk about the drum technique, practicing karate moves in the mall, 1980's souvenir magazines, action figures, and meeting Captain Lou Albano. Listen as we sweep the leg on this Adventure Club Podcast EXTRA! I talk a lot about the Karate Kid here on FASTE -- but probably not as much as I did when I recently joined Guy for a two-part Adventure Club Podcast all about the greatest movie ever made. I know that when news broke of Hostess shutting down, there were some people who rushed out and bought up every Ding Dong and Snowball they could get their grubby hands on. Although I will definitely miss the Hostess brand, I'm confident that my favorite products will be bought up by another company and I'll be able to continue indulging in the occasional frozen Ding Dong. Still, I hit the local grocery story this evening for a few random items and happened by the mostly empty shelves that were once home to infinite Hostess goodness. That's when nostalgia got the best of me. I spied a bag of chocolate Donettes. You know the ones I'm talking about. Sure there are other brands of these donuts available that look and taste exactly the same. But I had to buy these one last time. 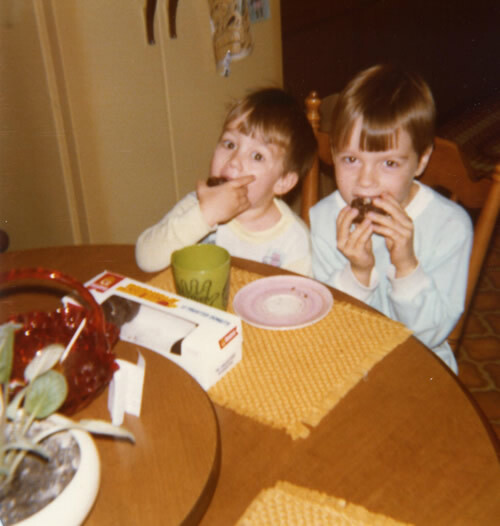 Not because they're so awesome (which they are) but because of a picture -- one of my favorite pictures ever taken of my brother and me. A winter morning in 1979. Hostess donuts and milk. And just like that...they're gone. Strange Kid blew my mind. Do you consider yourself to be the ultimate KARATE KID fan? Well, get ready to have you mind blown. I've often said that I don't remember much that I learned in college, but if you want someone to rattle off the names of the original cast members from Facts of Life, I'm your guy. What I mean is that my mind is like a steel trap when it comes to trivial pop culture nonsense -- especially from my youth. Although I admit that my brother is much more book-smart than I'll ever be, he too recalls things from our childhood that are amazing in their detail. This is why I've chosen to pick his brain a bit about a highly debated toy that he's been sitting on for years -- the Wonder Bread He-Man. First, let me start off by saying that the name "Wonder Bread He-Man" is ridiculous. This figure has absolutely nothing to do with Wonder Bread. Still, since that is how it is most often referred to, I will use this stupid name in this post. Secondly, from my own memory -- my brother's comments aside -- I definitely remember my brother acquiring this figure through a special mail-in offer of some sort. I used to annoy him by sing-songing the names of his Master of the Universe figures. Each time he'd get a new one, my song would grow. To this day, I recall singing: "He-Man. Man-E-Faces. Skeletor. The New Guy. Faker." The "New Guy" in my song was Wonder Bread He-Man. So after years of debate and uncertainty among toy collectors and MOTU "experts", allow my brother to drop some legitimate Wonder Bread He-Man knowledge on your eager minds. TL: How and when did you acquire this figure? BROTHER: It was with the wave where Man-E-Faces was released. I think it was the second wave. It was close to the beginning of when the Masters of the Universe figures were first coming out. So 1983. It was in May because I got my first figures for my birthday and I think it was Toys R Us where they were purchased. I bought He-Man and Skeletor and Man-E-Faces. Man-E-Faces had a deal where if you bought three...I was going to buy someone else...but I got Man-E-Faces instead specifically because if you bought three and he was one of them you got a mail-in offer for a fourth one. TL: What did you have to do to get this fourth one? BROTHER: I think you sent off the proof of purchase from three figures including Man-E-Faces. TL: It was a mail-in? BROTHER: Yeah. And it did not come with much of anything. No armor. BROTHER: Nope. Because I remember thinking it was just like a repainted He-Man with no accessories and thinking how lame it was that it only came with the brown shield. I had other shields just like it that didn't spin -- that piece would spin around the handle so I would have him hold it above his head and pretend he flew like a helicopter. TL: Some people claim to have a Wonderbread He-Man that came with this weapon or that. Some people claim theirs came with armor. What is your theory as to why you got a shield and other people claim they got a sword or something different? BROTHER: Man-E-Faces came with an extra set of the brown weapons -- a sword, an axe, a shield, a knife maybe? I want to say there were four or five of those that came with Man-E-Faces in addition to his brightly colored gun. I got another one of the same shields with the mail-in figure. I would think they probably had a supply of extra weapons that they just threw in one or two extra weapons with the figure. You may have gotten any one or two of those weapons. It's the same molds as most of the weapons that came with Castle Grayskull. Castle Grayskull came with more. TL: Where they brown, too? BROTHER: No. They were tan. At least mine were. I don't know if they were always the same. TL: What is your theory regarding the vague history of this figure among Masters of the Universe collectors? Why so much uncertainty? BROTHER: What age would have been collecting those? Not only that, but there really wasn't as much of a toy collecting community then -- people weren't trying to collect them for posterity. You didn't really keep it with the intention of remembering everything about it. TL: But with so much uncertainty out there, I find it hard to believe that you're the only person in the world that has a clear recollection of how you got your figure and what it came with. TL: Yeah, talk a little about that. BROTHER: There was a bonus weapons pack that came out a little bit later that came with that....that's Zodac's armor. I don't remember if it was the same color on Zodac or not but it's the same mold. And the black armor came with the bonus weapons pack -- it came with a neck-armor piece like Beast Man had, and shoulder pads. 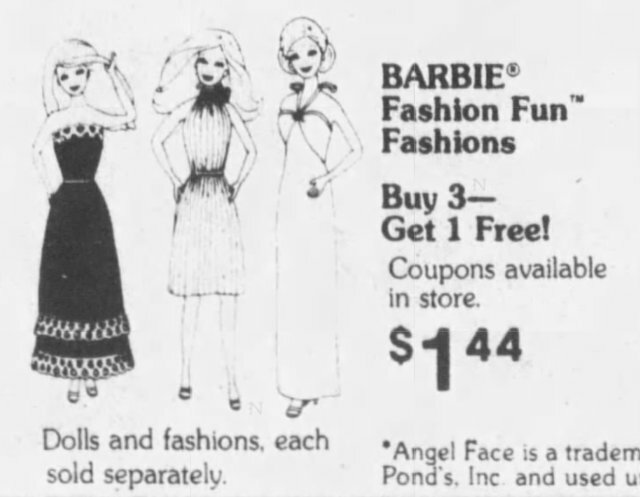 I remember they didn't fit or stay very well -- I always tried to put them on that new figure (Wonderbread He-Man) and they didn't stay very well or wouldn't stay fastened. I never kept any of those on him even though he didn't come with anything of his own because they just didn't fit right. TL: On a percentage scale, 0-100, how sure are you about the accuracy of all of the details that you recall? TL: You're certain about the weapons. There was no armor. TL: This figure had nothing to do with eating Wonder Bread. TL: You're certain it was a mail-in offer. BROTHER: Yes. And on the form there were other toys listed. Maybe Barbie and some others so I'm sure it was a Mattel offer. TL: It was a mail-in based on your purchase of Man-E-Faces. BROTHER: Yeah. Because I bought He-Man and Skeletor purposefully because it was the main good guy and the main bad guy. I think I was going to buy somebody else -- maybe Man-At-Arms -- and I decided to get Man-E-Faces instead. I think it was even mom's suggestion. She said if you get this one, you can send off and get another one. So I got Man-E-Faces purposefully because that was what you had to get to send off for the extra figure. Plus, Man-E-Faces came with that extra batch of weapons. TL: So scale of 0-100, how positive are you about all of this? TL: Last but not least, are you willing to sell this figure and if so, what's your price? BROTHER: I would think about selling it but I look at prices people are currently asking and think that they're inflated because nobody knows how many there. Not to mention that it's tough to tell which ones are authentic and which are fakes. So there you have it, friends and neighbors. You can continue digging around and making up your own theories about Wonder Bread He-Man. As for me, I know what he is and where he came from...and it wasn't from eating bread. Thanks to Matt from Dinosaur Dracula for digging up these ads which do nothing but support my brother's memories. Wallow in your misery, He-Man collectors. Or recognize the fact that this "mystery" is solved.